This is a start page for exploring the essential posts from the early years of ribbonfarm (2007-2012), retroactively named the Rust Age. Selected posts from these early years have been collected into 4 curated ebooks (edited by Jordan Peacock). Each collection is 50,000 – 75,000 words and contains a selection of 15-20 posts. Along with The Gervais Principle, and two off-ribbonfarm books, Be Slightly Evil (based on a newsletter that ran 2010-13) and Tempo (a stand-alone book on decision-making) these volumes provide a fairly comprehensive coverage of the Rust Age (and several weekends worth of reading). In The Art of Refactored Perception, Venkatesh Rao explores the broad question of how to think about any topic in “refactored” ways, by consciously cultivating sensibilities and disciplines of perception, mental preparation, metacognition, and execution. This volume should be of interest to anyone seeking to use writing as a medium of thought, and cultivating an ability to probe ambiguous themes for useful insights. In Towards an Appreciative View of Technology, Venkatesh Rao offers something of a course on technology appreciation, through a series of wide-ranging meditations that range from armchair explorations of container shipping and the garbage industry to speculative models of technology evolution and philosophical riffs on creative destruction and the idea of technology as a baroque unconscious. 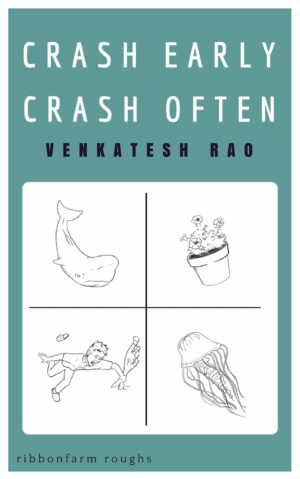 In Getting Ahead, Getting Along, Getting Away, Venkatesh Rao tackles head on what was perhaps the dominant theme of the Rust Age: amateur (and unapologetically amateurish) sociology undertaken with the unsociable sensibilities of an engineer. 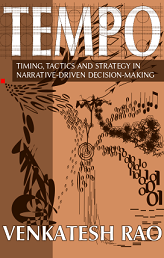 Determined to find fault with collectives (and redemption for individuals) he explores themes such as exit and voice, competition and cooperation, introversion and extroversion, solitude and collective experience. Alloyed with meditations on being cat-like and the social structures of globalizations, the result is a unique operating manual for navigating the social realities of our time. In The Mysteries of Money, Venkatesh Rao gamely tackles the mysteries of money, the business world, and the economy. While this volume will not make you rich quick (or slow), supply startup success recipes, or provide guidance on improving margins or setting interest rates, it should be of interest to anyone whose finance and economics curiosities extend beyond the mere making of money to the broader social realities it undergirds. Starting with a core set of essays on metaphors and mental models for money, the volume moves farther afield to the business world, startup culture, and consumer psychology, and ultimately to questions of life beyond the long, legibilizing reach of money. If you want to dive in more comprehensively (not recommended), here are the complete annual roundups from 2012, 2011, 2010, 2009, 2008 and 2007.